U.N. Secretary-General Antonio Guterres greets Kang Kyung-wha, South Korea's foreign minister, at the Human Rights Council at the United Nations in Geneva, Switzerland, Feb. 26, 2018. U.N. Secretary-General Antonio Guterres is criticizing the failure of governments to implement a Security Council resolution for a 30-day cease-fire in war-torn Syria. Addressing the opening of the U.N. Human Rights Council’s four-week session, Guterres called for an immediate end to the fighting. Syrian government forces began bombing the rebel-held enclave of Eastern Ghouta, a suburb of Damascus, only hours after the Security Council adopted a cease-fire agreement. 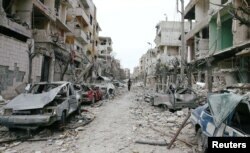 The damaged cars and buildings are seen in the besieged town of Douma, Eastern Ghouta, Damascus, Feb. 25, 2018. Clearly stung by this event, U.N Secretary-General Antonio Guterres told delegates at the Human Rights Council that Security Council resolutions are only meaningful if they are effectively implemented and sustained. Members of the U.N. Security Council vote for cease-fire to Syrian bombing in eastern Ghouta, at U.N. headquarters in New York, Feb. 24, 2018. 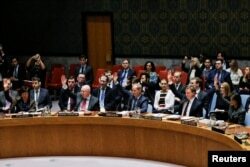 “And, that is why I expect the resolution to be immediately implemented and sustained, particularly to ensure the immediate safe, unimpeded and sustained delivery of humanitarian aid and services, evacuation of the critically sick and wounded and the alleviation of the suffering of the Syrian people... In particular, Eastern Ghouta cannot wait. It is high time to stop this hell on Earth,” he said. The U.N. high commissioner for human rights, Zeid Ra’ad al- Hussein, was frank about who he said was to blame for the ongoing carnage in conflict-ridden parts of the world. Zeid cited Eastern Ghouta and other besieged areas in Syria, the Kasais in DR Congo, Taiz in Yemen, Burundi, and northern Rakhine in Myanmar as some of what he termed today's most prolific slaughterhouses of humans. Zeid praised France and Britain for championing a code of conduct on the use of the veto; but, he denounced the three other permanent members of the Council — China, Russia and the United States - saying they had derogated their duty. He called on them to end the "pernicious use" of the veto.